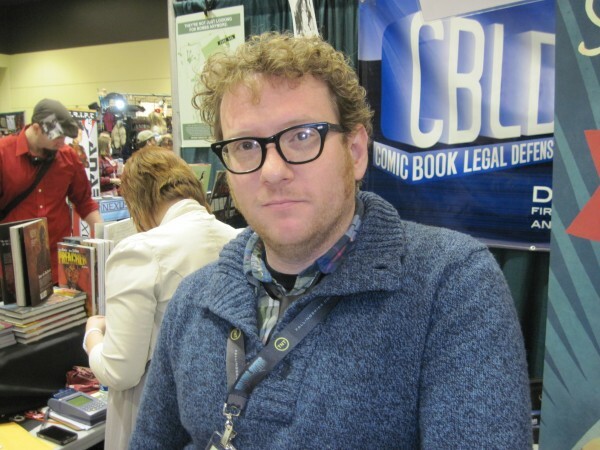 TOM SPURGEON: Charles Brownstein refers to you as an equal partner at the CBLDF. Can you talk a little bit about how you've carved out what your responsibilities are, where you've been able to be of most use? Is the entirety of what you do kind of ideally based on things you do well, or has there been a learning curve on any part of it? ALEX COX: Jeepers. In the two plus years I've been here, it's been kind of a non-stop rollercoaster. I've never even stopped to consider this. Most of what I do is just managing/juggling the half-dozen fundraising projects we have rolling on any given day, to hopefully free some time up so that Charles can work on our education and program initiatives, which are a huge priority right now. I tend to handle our booth presence at shows, which had a huge learning curve, and I'm very glad for it. The amount I've learned about getting in and out of convention centers is epic. I enjoy building our booth displays -- I've been working in comics retail since I was 19, so stacking up rows of books feels natural at this point. I came into this job as a development person, but I've been very lucky to learn so much about every aspect of the industry, beyond fundraising. It's a dream job for the curious type -- which I like to think I am -- because there are new and wildly varied challenges weekly, and you have to educate yourself to stay in motion. So I guess to answer your question, a lot of what I do stems from things I'm comfortable doing, but there is a continuous learning curve, and I like it that way. SPURGEON: Comics can be odd in that unlike other industries where one might work there's almost always a direct connection to one's youth. Can you talk about your comics reading when you were a kid, what you still carry with you from those days even if it's just a familiarity with a certain kind of comic book or a leftover affection for their makers? COX: My comic tastes and interests are pretty catholic, as you've probably picked up on from past conversations. I'm pretty sure this is a result of the scarcity of comics in my youth -- because I was in the middle of nowhere, finding comics was a rare treat. So aside from the few grocery store spinner-rack Archies and Transformers and Batman, finding comics meant infrequent trips to a comic shop three towns over, and that comic shop was the best kind of mid-'80s direct market stereotype. 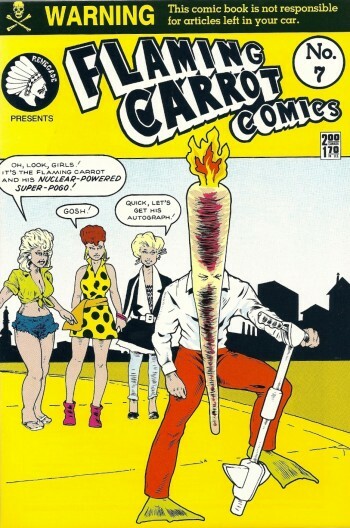 The owner was a sci-fi paperback junkie who hated all comics except for Cerebus, so titles like Flaming Carrot were displayed alongside Spider-Man with equal prominence. So in my mind there was no difference between Grimjack and Dreadstar and X-Men. I had a few older friends who handed down comics to me, and their tastes were honed in the same shop, so we were all reading the original Turtles and Groo and Love And Rockets as much as anything else. Lots of reprints of Heavy Metal-type euro comics and low-rent 1970s Kung Fu comics. It was spectacular. SPURGEON: Alex, my memory is that you were raised in Tennessee. Is there a difference at all in terms of growing up in the South and wanting to make comics, or the comics culture there, or is that pretty much the same wherever? COX: I grew up in rural Tennessee in the 1980s, and the comics culture, as I remember it, was myself and maybe three other people. [Spurgeon laughs] The comic shop I mentioned, I don't think I ever saw anyone other than my handful of friends there. As far as we knew, we were the only comic fans in the state. The funny end to that story is that two of the three or four other fans I knew ended up in the industry, and I see them pretty regularly at shows. Winchester, Tennessee has produced a per capita ratio of comic industry folks that rivals NYC. SPURGEON: My memory is also that you also at one point went to art school, but I'm not sure if you were focused on comics-making while there or what your goals were. What were your artistic ambitions when you went to school, and how did you end up going to the place you attended? COX: I went to the School of Visual Arts, based on two simple reasons. One, it was in New York, and I had figured out by the time I was 12 or so that I was going to end up here. The other reason was that Harvey Kurtzman and Walt Simonson both taught at SVA -- Mr. Simonson may still; I'm not sure -- and I figured if two of my favorite cartoonists vouched for the school by being on the faculty, it had to be a classy joint. I actually majored in film and TV production, because I wanted to do prop and set design. SVA had an amazing program -- probably still does -- and every single person in my class that wanted to work in the film industry ended up there after graduation. I worked in TV very briefly, and it wasn't for me. So I went back to comics retail, which was my part-time job in college. I really love comics: not just the art form, but the world. I guess I had to step out into a gross industry to realize how great the comics world is. SPURGEON: Am I right in thinking that you still make art, and that you also have a hand in with certain art direction and design tasks at the Fund? Someone mentioned to me that they admired the diligence with which you pursue your artistic goals. COX: I have done some freelance illustration off and on since I was in high school, ranging from textbook illustration to storyboards to whatever someone offers me that seems fun. Examples of the bizarre range of work I've done: I once drew the caricatures for an artist playing a sidewalk artist in a commercial for diarrhea medication, and I drew tiny cartoon versions of Michael Kors and Tim Gunn for the Lifetime Network's Project Runway website. In 2013 I'm illustrating a book for Penguin that's being written by a friend. I'm not sure how much I can say, but it's pretty exciting. COX: I draw comics for fun, and post them on a website strictly to entertain my friends. Sometimes I will staple up a few and hand them out at small press shows, but it's been a while since I've had time for that. They are usually shaggy dog tales about dudes who end up inadvertently naked. I only noticed this recurring theme recently, but I'm okay with it. [Spurgeon laughs] I wish you'd tell me who said they "admired my diligence" so I could shake their hand. My biggest regret in this rotten life is that I haven't drawn more comics, even if they only get Xeroxed and handed to my buddies. I really love drawing those dumb little things. As far as art direction goes, I guess you could say that, although that gives me more credit than I probably deserve. There are certain projects, like the 2013 year-in-review comic, that I manage, which involve wrangling talented people into producing awesome items, but there's not much "directing" to do when Cliff Chiang lays waste to the world with his first stab at a membership card design. When you have guys like Bob Fingerman or Ben Templesmith or R Sikoryak doing art for you, you don't direct. You just enjoy the results, which are amazing. I should also add that a lot of our branding and design work was handled by Jared Fletcher, with only meager instruction from my desk. He designed the hugely popular "I READ BANNED COMICS" shirt, and most of our new membership materials. He's a dynamo, and a helluva cartoonist, and anyone interested in logo design should check out his process. SPURGEON: You mentioned going into retail, and I think Rocketship is the primary association a lot of people have with you, perhaps even more than connecting you to the Fund. How do you look back on that experience now? What are the main memories? Does it help at all in terms of how you approach this job to have had that very specific set of experiences? COX: It absolutely helps; working retail in a specialty store is a great education in the history of comics, and that is very important to what we do. I like to think I understand the comic fan brain, and I have internalized forever the threats and fears and worries of selling books. I have lived and breathed comics for a long time, and a big chunk of that is time spent in back issue bins, Alpha Flight to Zot!. All told, I spent well over a decade in comics retail, from bagging back issues and grading collections to eventually co-owning my own shop, which is a world unto itself. As far as my memories of owning the store, it was only two years ago, so it's incredibly fresh. I remember well my favorite regular customers, and still stay in contact with many of them. I made a lot of friends behind that counter, and there's nothing more valuable than that. Sorry, that sounds sappy... I do believe it, though. SPURGEON: As I recall, when you left retailing you expressed an idea that you just couldn't see yourself doing that job for x-number of years, which I thought was a really honest appraisal of the path ahead of you. Is it just a matter of you finding work that you find interesting or valuable as you go, do you think? Is there an ultimate goal in mind for you vocationally? COX: Owning a store is an awful lot of stress, which some people handle better than others. I don't deal with it well, and things that my peers could roll with gave me panic attacks. My partner had mustered out, for the most part, somewhere near the middle of our five-year lease, and I realized pretty quickly that I didn't want to go it alone. So it was a matter of finding work that I felt was important, but also just something new; a different challenge. When we opened the shop, it was less about selling comics to X amount of weekly subscribers -- which is a perfectly fine model -- and more about sharing our enthusiasm and love for comics with everyone in South Brooklyn, which didn't have many neighborhood stores at the time. I wanted to evangelize about nine-panel grids and Ditko hands and Kirby krackle and that amazing and funky way Dan Clowes used to draw arms. We wanted to find the right comic for everyone, and get good comics in the hands of kids. So in a lot of ways, in retrospect, working at the Fund is a natural extension of what I was trying to do. Advocacy work, outreach, keeping comics in libraries -- and available to kids -- when they are challenged. As far as an ultimate goal, I would say there's probably not a specific endgame. I have been preaching about comics to an unsuspecting public since college, and I hope I can keep doing that. I love Comics; the industry, and art form, and community. I love it a lot, and want to keep promoting and boosting comics as long as I can. SPURGEON: One more thing about retail; the Fund's relationship to the Direct Market community has sometimes been a bit less than unenthusiastic. Do you have any perspective on what members of that community that haven't been fully invested in the Fund's mission might be thinking? Has your relationship with retailers improved over the last couple of years? It seems like it has, but I'm not certain. COX: Oh, heck yeah. Retailers come through big-time every year, and our Retailer Membership numbers for 2012 are higher than ever. I would say the relationship between the Fund and the retail community is not only robust, but a big, warm bear hug, financially and in terms of program support. As you know, the Fund was started when a retailer was attacked by local law enforcement, and protecting the rights of the Direct Market is a big chunk of our mission. Retailers know that, and support us as brothers-in-arms. In the past year, we've seen our relationship with ComicsPRO grow substantially, and the members of that organization really are industry leaders, and do important work. And on a personal level, I love comic shops, and I love comic retailers. I love working with them, and when we need help, especially when we are on the road and out of our element, we can always count on a LCS to come through in a pinch. SPURGEON: Okay... you know, I wanted to talk to you about cons a little more generally. You've been to a bunch, and 2012 seems like a pretty great year for shows. You're connected, but you also have an outsider's perspective. Why do you think there were so many good shows this year? COX: Well, most of these shows are run by people who have figured out what they are doing. It sounds flip, but really, when you're talking about HeroesCon or Baltimore or Emerald City Comicon, you have a staff of people putting on those shows that simply know what they're doing. They are creating an experience that is easy, pleasant, and fun for attendees and exhibitors alike. Good shows run like a well-oiled machine because the people running them are prepared and efficient. Comic-Con International amazes me at every show: that is an organization that moves like a swiss clock. Not an insightful answer, but I think it really comes down to talented people working hard. They make a show easy for exhibitors, and artists, they advertise thoughtfully to their local markets, and the next thing you know, you have a hall packed full of happy fans, which is ultimately the gauge for a good show. SPURGEON: I actually think that's a very insightful answer. Comics doesn't always appreciate the value of execution as much as it should. You mentioned to me once that the show in Denver was one you thought of as a pretty good one and under the radar, and you also mentioned to me how interested people get about the Fund at shows like Emerald City, where the audience members are maybe not particularly informed about the Fund or what it does. What makes a good show generally? What makes a good show for the Fund? Did you see more instances of that kind of positive curiosity this year? COX: Our show presence is split between fundraising and programming. Raising a lot of dollars is great, but we are happiest when we raise a lot of dollars but also pack a program hall full of people who leave knowing more than they did when they walked in. When we have great volunteers who can speak clearly about our mission, increase our membership, run a few informative panels, and raise money, we've had a good weekend. When we have a room full of people who are not sure who we are, that's great; that's an opportunity to educate and expand our membership base. That means the Con organizers are doing an amazing job bringing in new fans, and it means we are reaching a new audience. It's win-win-win, all around. I've found that people are, 999 times out of 1000, encouraged and excited by our mission. And the one in a thousand that isn't excited still understands why the work is important. The First Amendment protects the most basic human rights, and people get fired up about it. When we give people the history of the CBLDF, and tell them about artists who were prosecuted just for lines on paper, it's shocking. I know that personally, I find censorship completely disgusting, and I have yet to find a compelling argument for the restraint of artistic content. And I've found that in talking to comics fans, almost everyone feels the same way, when you have the conversation. SPURGEON: As someone who went to school in New York and has now had two -- or more, I guess, definitely three -- roles in the comics community there, do you think that comics still has a kind of significant New York bent? COX: If I ever thought that, and I probably did at one point, I wouldn't say that's the case now. It's an obvious thing to say, but you can make comics anywhere, and you certainly don't need to be part of a studio or clubhouse in an urban area to be making great comics. Chris Onstad made -- and is still making -- some of the greatest comics of the decade on the west coast, with no contact with anyone in the community for years. Achewood is a straight-up masterpiece, and he started that by just putting strips up on a website. So artistically, I don't think New York has been the center of the comics world since the advent of FedEx. In terms of the business of comics, sure, for the past 70 years or so, you mostly needed to be near New York, but that was the case for publishing in general. 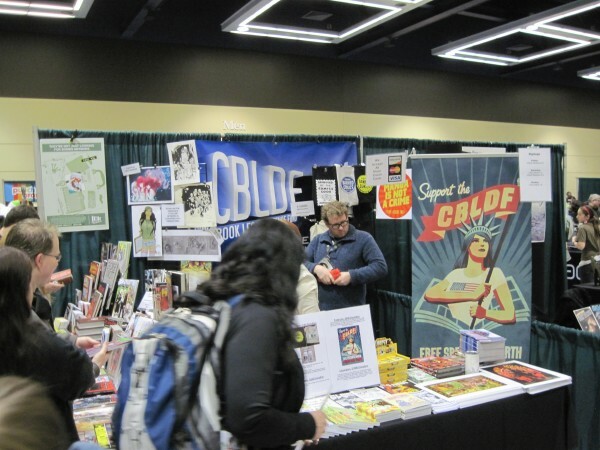 Comics has some terrific and important publishers on the West Coast, so that has changed as well. SPURGEON: The last two times I went to the Fund's office I picked up some books from you, and in fact last summer at San Diego I went behind the table just so I could read your copy of the Groo The Wanderer Artist Edition. Can you suggest maybe one or two books or titles you think are underread? COX: Yikes. My tastes are pretty catholic, as I may have mentioned, so that question depends on who I am talking to. I think All-New X-Men is hilariously awesome, but I'll read anything drawn by Stuart Immonnen. I would recommend that to anyone who doesn't read superhero books, and wants to check out the most over-the-top blend of insane melodrama and sci-fi action on the stands. It's a perfect explosion of beautifully-illustrated pages and old-school superhero silliness. Of course, that's a best seller, hardly "underrated." I am not going to be good at this, Tom. [Spurgeon laughs] But you asked, so here we go! Speaking of Aragones, his Funnies from Bongo is a master class in storytelling every time it comes out. He is basically the greatest person. I would recommend The Massive from Brian Wood; it feels like nothing else on the stands and has a sustained tension that few serialized books can pull off. His world-building is deliberate and subtle, and you really feel like you're getting something substantial for your buck. 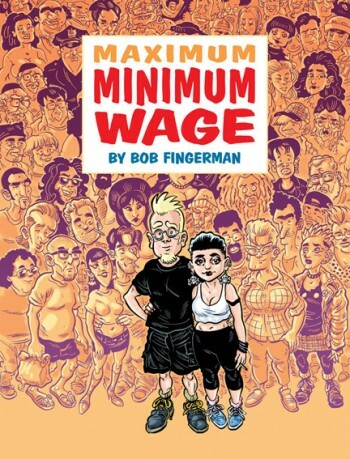 I'm excited for Maximum Minimum Wage from Bob Fingerman. That's an amazing piece of work. I think coupled with Hate, you have two Great American Novels of the 1990s. Fingerman is one of the great, natural cartoonists -- when you look at a page he's drawn, it's so effortless and perfect it could make you cry. I love Roger Langridge's Popeye from IDW. He is nailing Segar's language and cadence while still adding his won sense of humor and whimsy. The issue he drew as well as wrote was a classic. Godzilla: The Half-Century War is beautiful madness. Anything by Richard Corben is still worth buying immediately, and I am a sucker for Hellboy. I picked up Nate Bulmer's book Eat More Bikes at BCGF, and laughed out loud. Pope Hats from Ethan Rilly is the real deal. It's gonna be some sort of brain-melting work when it's compiled; he has drawing chops that are rare and wonderful. We are living in a golden age of reprints as well. Anyone who stopped getting the Peanuts hardcovers after the 1950s needs to remedy that posthaste. That strip has a reputation for falling off in the 1980s, but that is a filthy lie. The MAD archives are getting into some prime-era material, and the second Kamandi hardcover just came out. That is possibly the greatest comic ever published, and the new format is stunning. The colors glow like magic gems on the paper stock they used. Humanoids has also recently reprinted some of the greatest European genre comics I've ever read, between Moebius and Bilal and Jodorowsky. These are in affordable paperbacks and are basically all worth owning. Gah!! I could keep going all day! Wonder Woman by Chiang and [Brian] Azzarello is an epic poem crossed with Terrence Malick, and Chiang's art is probably the most lovely work coming out of DC at the moment. Those are just things I read recently. You can't ask me to recommend books, Tom. I will keep going into the wee hours.